The WMU is designed for use on standard 8"-grouted masonry block wall construction (GFCMU). Minimum f'm is 1,500 psi. End vertical must be minimum double 2x. Installed between blocks with two 0.162" x 3 1/2" duplex nails cast into grout with a minimum of one grouted course above and below the top flange and one #5 vertical rebar minimum 24" long in each adjacent cell. Install on top of wall to a grouted beam with Titen® 2 masonry screws. Refer to technical bulletin Sloped Joist in Non-Sloped Hangers (T-C-SLOPEJST) for information regarding load reductions on selected hangers which can be used without modification to support joists which have shallow slopes (3/4:12). WMU may be sloped up to 45° with no reduction in download or uplift. WMU may be skewed up to 45° with no reduction in download. There is no uplift load available. WMU may have the top flange offset left or right for placement in corners. The allowable download is 0.50 of the table load. Uplift loads do not apply. A one-page technical bulletin discussing the performance of non-sloped hangers used to support a sloped joist. It includes reduction factors for B, ITS, HU and welded-series hangers. 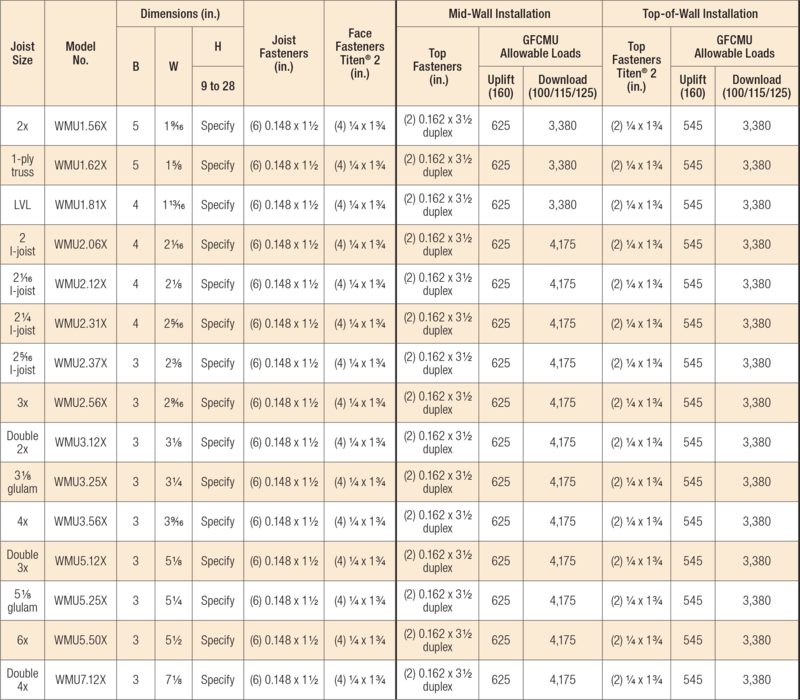 See figures for top-of-wall and mid-wall installation. Products shall be installed such that Titen® 2 screws are not exposed to exterior environments. Fasteners: Nail dimensions in the table are diameter by length. Titen 2 screws are Simpson Strong-Tie masonry screws. For additional information, see Fastener Types and Sizes Specified for Simpson Strong-Tie Connectors. WMU1.56X No evaluation report listing. WMU1.62X No evaluation report listing. WMU1.81X No evaluation report listing. WMU2.06X No evaluation report listing. WMU2.31X No evaluation report listing. WMU2.56X No evaluation report listing. WMU3.12X No evaluation report listing. WMU3.25X No evaluation report listing. WMU3.56X No evaluation report listing. WMU3.62X No evaluation report listing. WMU4.06X No evaluation report listing. WMU4.68X No evaluation report listing. WMU4.75X No evaluation report listing. WMU5.12X No evaluation report listing. WMU5.25X No evaluation report listing. WMU5.31X No evaluation report listing. WMU5.50X No evaluation report listing. WMU6.06X No evaluation report listing. WMU6.88X No evaluation report listing. WMU7.12X No evaluation report listing. WMU7.50X No evaluation report listing.